Enroll your personal or corporate-owned Android device to get secure access to company email, apps, and data. Company Portal supports Android devices, including Samsung Knox, running Android 4.4 and later. Samsung Knox is a type of security that certain Samsung devices use for additional protection outside of what native Android provides. To check if you have a Samsung Knox device,> go to Settings > About device. If you don't see Knox version listed there, you have a native Android device. 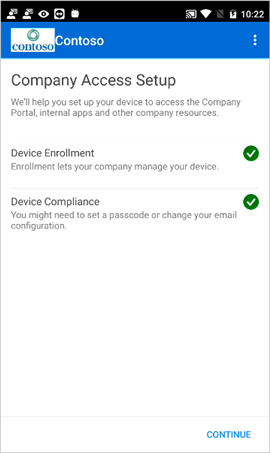 Make sure to install the free Intune Company Portal app from Google Play. During enrollment, you might be asked to choose a category that best describes how you use your device. Your company support uses your answer to check the apps that you have access to. 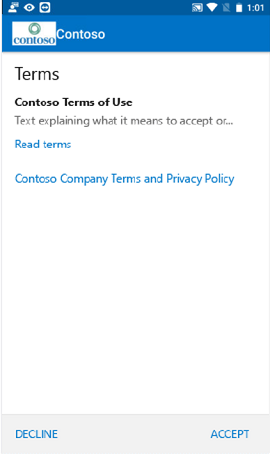 If prompted to accept your organization's terms and conditions, tap ACCEPT. This screen might be slightly different from the example screenshot below. 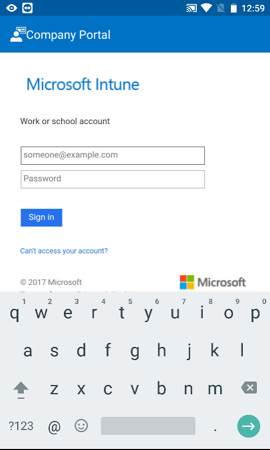 Sign in to the Company Portal app using your work or school account and password, and then tap Sign in. 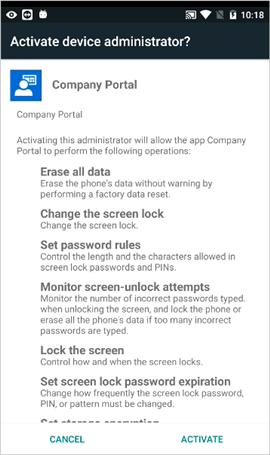 On the Company Access Setup screen, tap CONTINUE. The yellow triangles don't mean you've already got an error. Those icons indicate that there are still steps to be completed in the enrollment process. Review a list of what your company support can and can't see on your device, and then tap CONTINUE. On the What's next? screen, read about what happens during enrollment, and then tap ENROLL. If you're using Android 6.0 or later, do this step. Otherwise, go to the next step. Allow Company Portal to make and manage phone calls? If you see this message, tap ALLOW. It is safe to tap ALLOW because Microsoft never makes or manages your phone calls! Google controls the message text, and Microsoft cannot change it. When you allow access, all you're doing is letting your device send your device's international mobile station equipment identity (IMEI) number to Intune. The IMEI number is like a serial number that uniquely identifies a mobile device. If you deny access, the message will appear again the next time you sign in to the Company Portal. To turn off future messages, select Never ask again. To reverse the access permission, go to Settings > Apps > Company Portal > Permissions > Phone, and then turn on the permission. 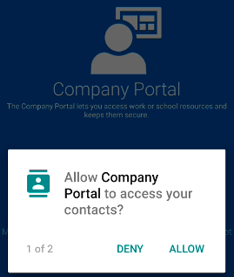 Allow Company Portal to access your contacts? If you see this message, tap ALLOW. 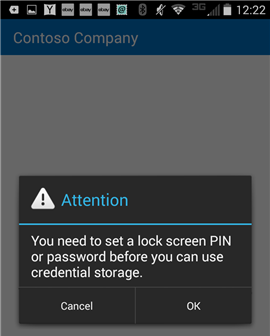 It is safe to tap ALLOW because Microsoft never accesses your contacts! Google controls the message text, and Microsoft cannot change it. 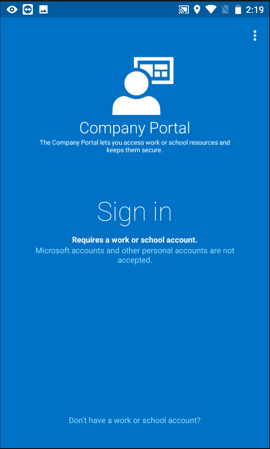 When you allow access, it only lets the Company Portal app create, use, and manage your work account. 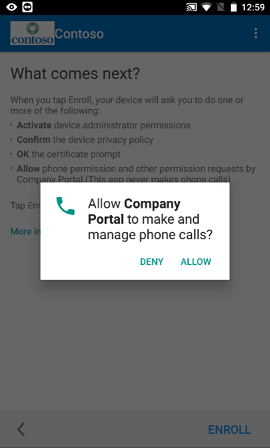 If you deny access, the message will appear again the next time you sign in to the Company Portal, but you can turn off future messages by tapping the Never ask again box. If you later decide to allow access, go to Settings > Apps > Company Portal > Permissions > Phone, and then turn on the permission. The device administrator role is one that the Company Portal needs to manage your device. It allows your admin to see certain things - like how many times you've attempted to unlock your screen - and to take some actions. Microsoft does not control this message, and we understand that its phrasing can seem somewhat drastic. There's not a way for the Company Portal to display just the restrictions and access that are relevant to your organization. All of them are granted at once on this screen. Contact your company support for more information using the contact information in the Company Portal website if you have questions specific to your individual organization's use. 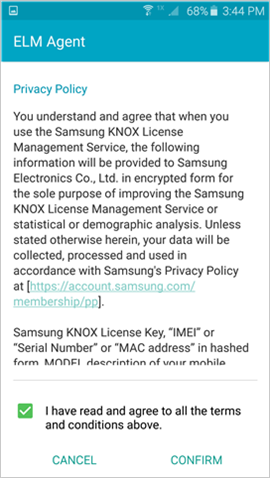 If you are using a Samsung Knox device, tap Confirm, and you’ll see a message that your device is being enrolled. 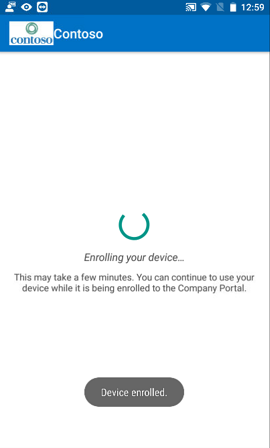 If you are using a native Android device, just notice the following screen that shows that your device is being enrolled. This screen shows that your device is being enrolled. 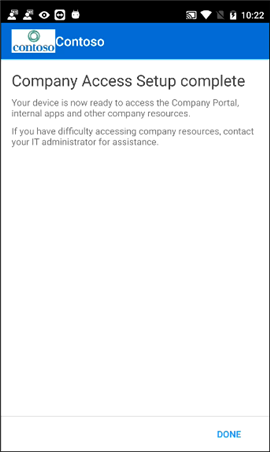 When the Company Access Setup screen appears, tap CONTINUE. If a message indicates that your device is out of compliance, follow the instructions to fix the issue, and then tap CONTINUE. You can find out more about the issues by tapping on them. On the Company Access Setup complete screen, tap DONE. Your device is now enrolled. Before you try to install company apps, go to Settings > Security, and turn on Unknown sources. If you don't turn on this option before you try to install apps, you'll see the following message: "Install blocked. For security reasons, your device is set to block installations of apps obtained from unknown sources." You can tap Settings on the error dialog box to go to the Unknown sources option. If your organization is using telecom expense management software, you will have an additional few steps to complete before your device is fully enrolled. Find out more here. If you get an error while you try to enroll your device in Intune, you can email your company support. Still need help? Contact your company support (check the Company Portal website for contact information), or write the Microsoft Android team.